I’ve always been attracted to bright colors. I like quilts and pieced together things like granny squares. I like tie dye. 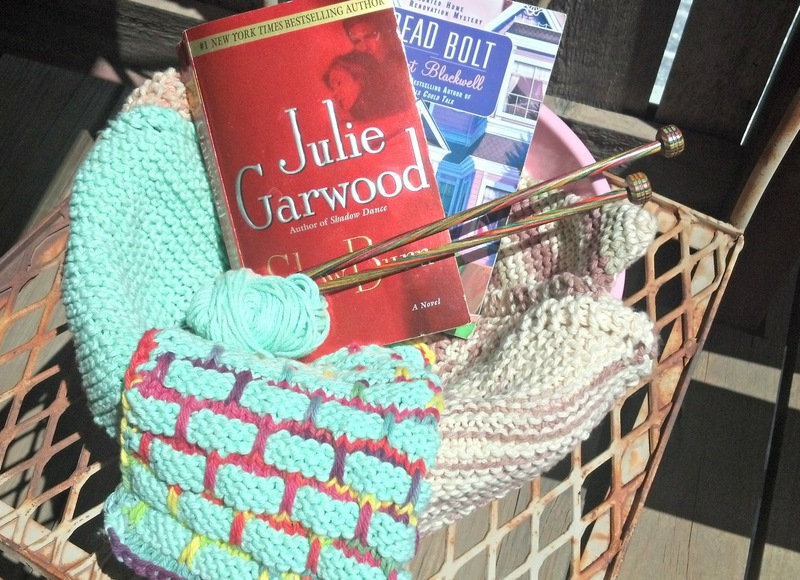 I tend towards variegated yarn rather than solid color. I used to tell the kids in my classes that plaid was my favorite color! No, they didn’t get it either. 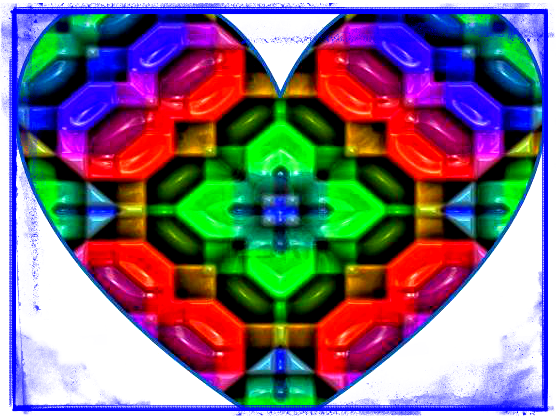 I like kaleidoscopes. The vivid colors of the rainbow combined in extraordinary patterns capture my attention for considerable amounts of time. Stained glass and just colored glass with the sun shining through it is fascinating. I save empty colored bottles and set them outside to catch the sun. I suppose that could explain some of the following. Years ago I was a camp counselor at a Campfire camp in Cuba, New Mexico. We were told the place was supposed to be an old Spanish Hacienda. (That can be another post.) Anyway, the owners, I guess, had built a house and in the house was a fireplace. 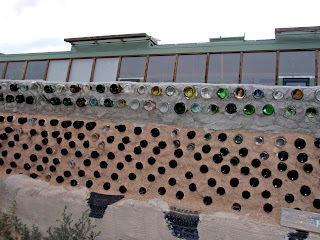 This fireplace had a wall surrounding it that was made of stucco and empty bottles. The bottles had the bottoms facing out to the room. There was a light behind the wall and when it was on shown through the bottles making a stained glass effect. It was unique and really pretty. I was told that the planning wasn’t so good and the builder neglected to leave a way to change the bulb. That meant when it burned out it was just a wall with bottles showing. Hmmm. That was my first exposure to a bottle wall. But I was hooked. 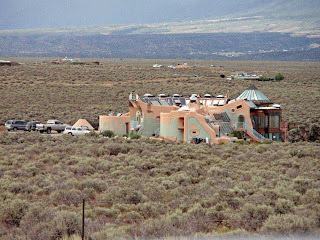 Recently on a long road trip, we passed through Taos, New Mexico. 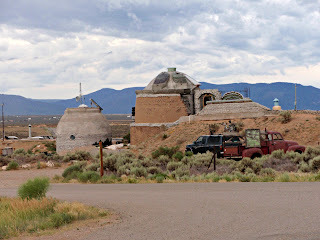 It’s an interesting town in itself but about twelve miles out is a place called the Greater World Community. When you come upon it you wonder just what it is. 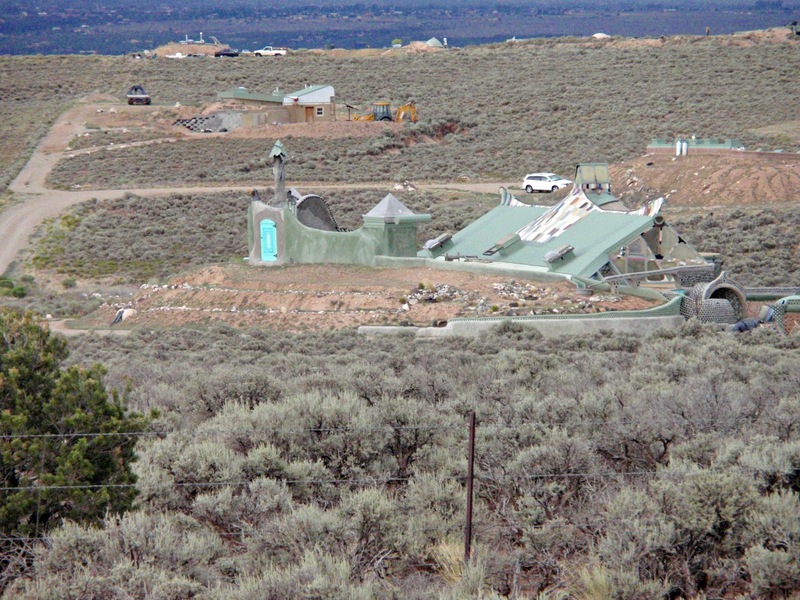 It looks like a 70s throwback, a commune almost, of structures half buried in the ground. It’s considered a subdivision and is designed to ‘create an ideal condition from which a sustainable community can grow and prosper’. 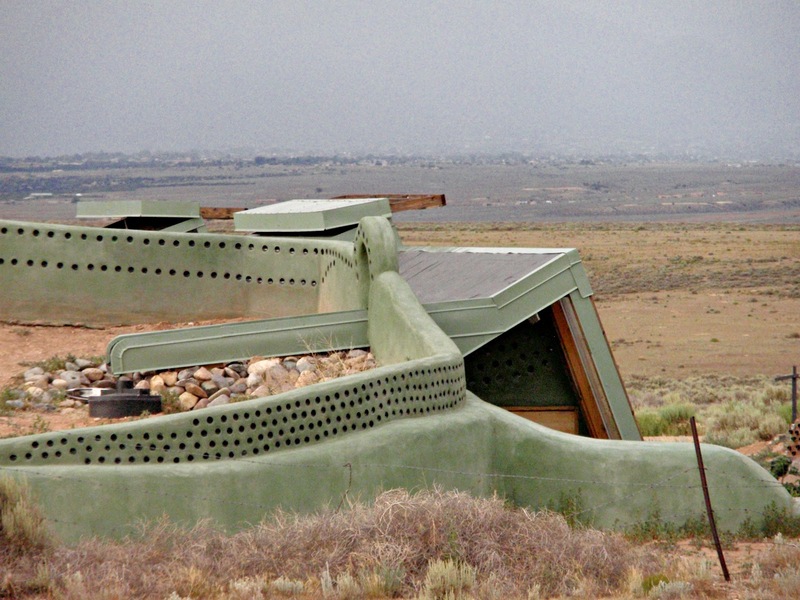 The houses are called earthships, supposedly because they are in and of the earth, created of earthen materials and built into the ground. The ‘ship’ part of the term refers to the experience of living in a ship (boat), which requires dwellers to be independent. Besides earth, the houses are built using mostly recycled materials such as old rubber tires, tin cans and bottles. Yes bottles! There are supposed to be about 60 houses out there. Every unit is unique but at the same time must conform to the restrictions of construction. All of them are built into a hill. The hill has to be on the south and every earthship has windows on that side. Dirt is pushed up against the northern side to help preserve heat in the winter and coolness in the summer. Each house must have solar heating and cooling, be built with natural and recycled materials, use electricity obtained only by solar or wind means, harvest water and include on-site sewage treatment and containment. A new requirement is that food must be produced in the house itself, and I don’t mean just cooking dinner! 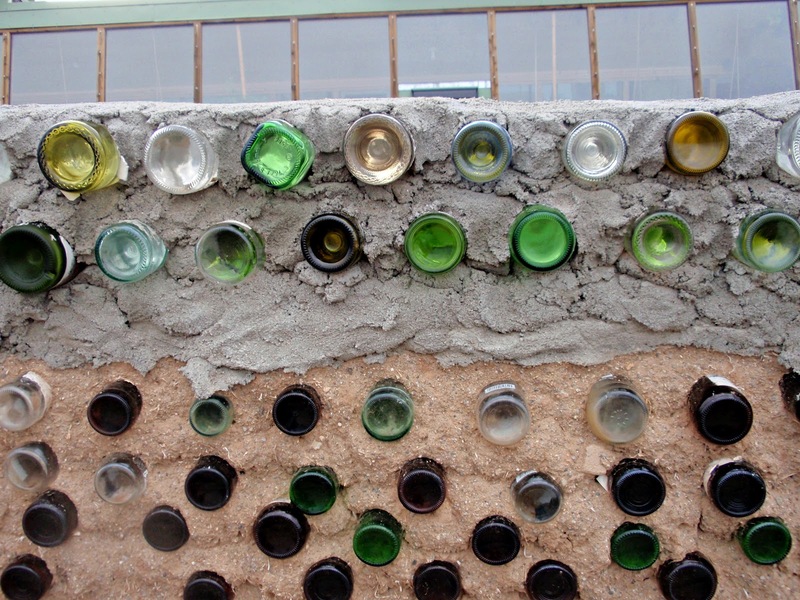 Up close, bottles in mud and cement. 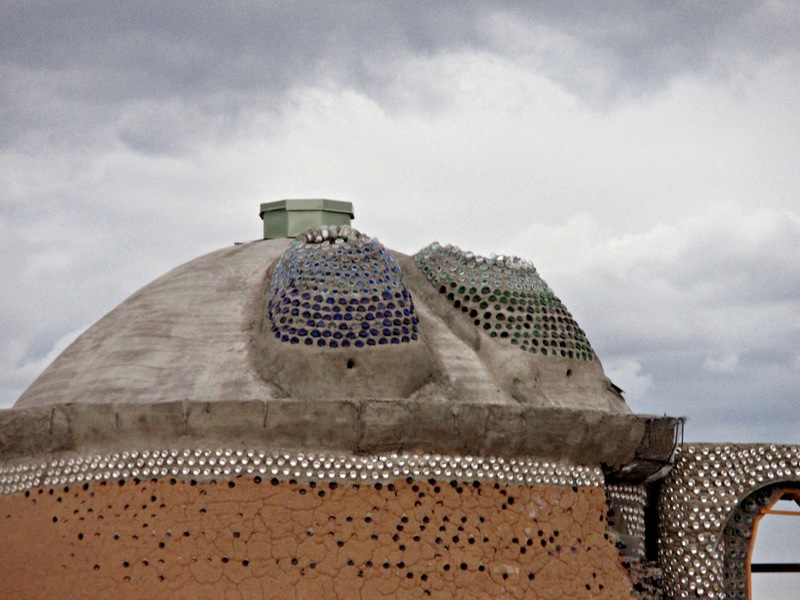 Bottle skylights and tin can arches! 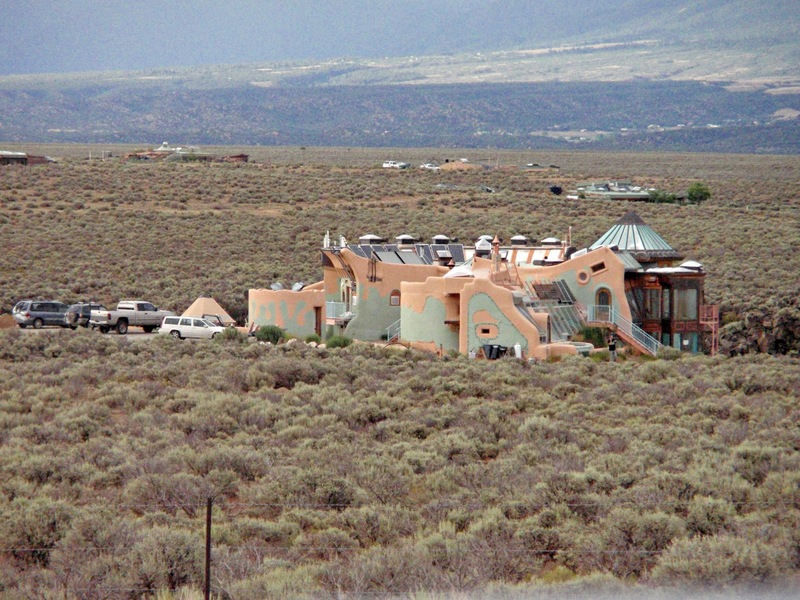 The houses look like a cross between a castle and something from Star Wars. They are curious indeed. Some may call them dugouts. What really captured my attention are the bottIe walls that many have incorporated. The bottles act like bricks but allow the light to pass through as needed in rooms such as bathrooms. They aren't strong enough to be supporting walls but they are often used as interior dividers or outside dividers. 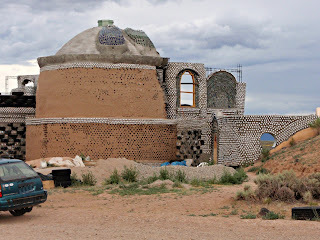 One of the earthship houses. This one looks like it's still in construction...but is inhabited. Up close view of walls made of old tires and tin cans. Under construction, tin cans and mud filled tires. 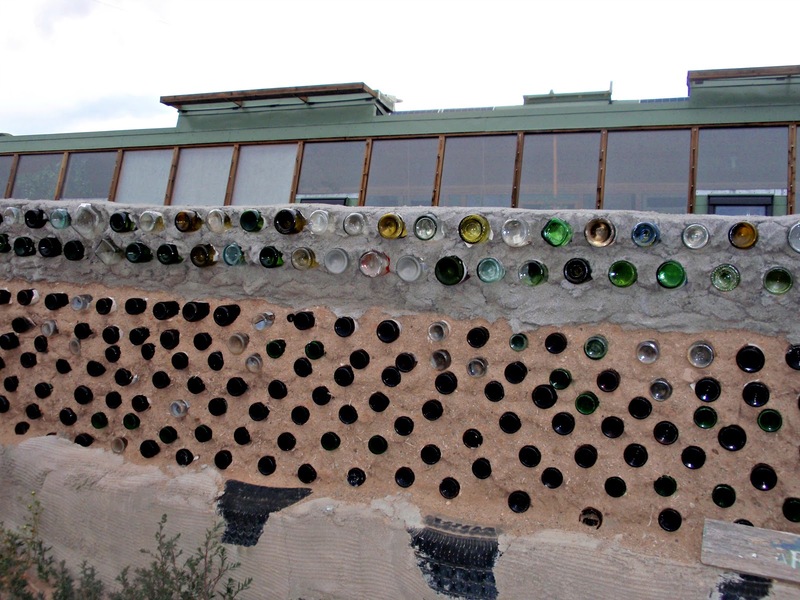 A bottle wall, finished and stuccoed. After viewing these walls up close and personal, my inner hippie started to emerge. I decided I need to build one of these walls. I approached the subject with my husband, and after getting ‘the look’, he said he’d buy me some cement! Now it is going to take some time, but I really want to do this. Of course I’ll need a lot more bottles. Better get busy! 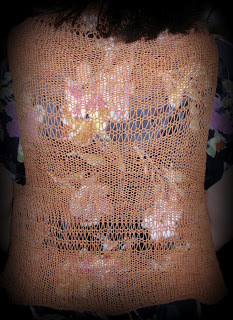 I finished knitting my Linen Top I was working on last week. All I have to do is sew it together and block it. I’m bad about that so we’ll see! 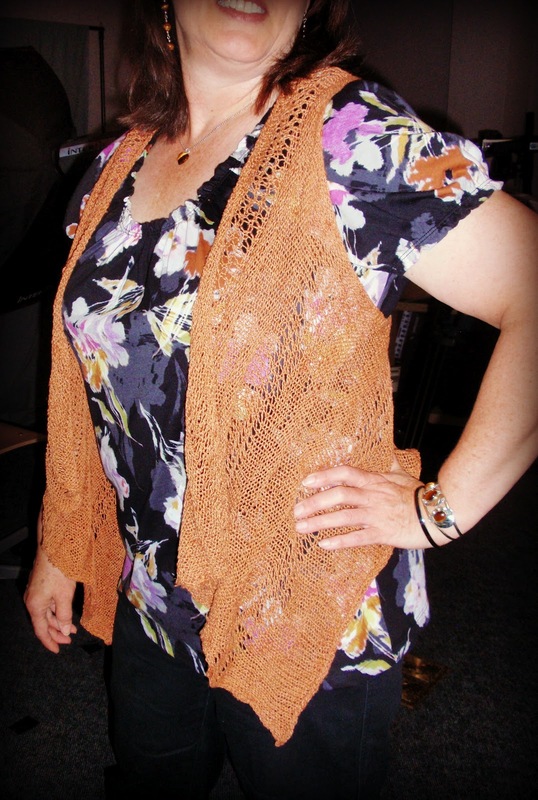 But I did actually block my Roberta’s Wrap. I wore it to work and got a lot of compliments. Then I say I made it and they are astonished. They wouldn’t be if they knew how easy it was! Wide angle for the back view. I’ve been making up some potholders and dishrags for Christmas. They are easy and portable and all the kids have been asking for them so it’s productive. I managed to get in a couple of books, too. The first was Slow Burn by Julie Garwood. It’s about a sweet girl who suddenly comes into a large inheritance. After that, someone wants her dead. Surviving two explosions and other attempts on her life, romancing a policeman who happens to be the brother of her best friend, and managing to stay alive while still balancing a business and keeping a home for her sisters certainly kept my interest! Dead Bolt is a sequel to a book I enjoyed earlier in the year, If Walls Could Talk, by Juliet Blackwell. Like the first book, ghosts are seen by the female contractor while remodeling a house. There’s murder, mystery and mayhem but all comes out well in the end. It was a good read and I hope to continue with the series. 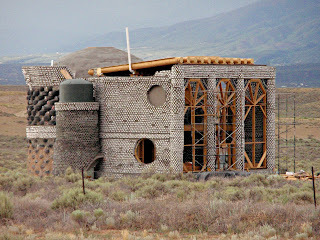 I wonder if you if you can remodel an earthship home or if you’re stuck with whatever you end up with. I’m still enchanted with the idea but after researching found there all kinds of ‘strings’ attached if you want to build or live in an established community. That seems funny for a bunch of people wanting to get back to nature! I doubt that I could live that way, regardless. I’m a little claustrophobic! So in the meantime, I’ll just add to my bottle collection and someday start that wall! Wow! That place is awesome - I've never heard of it! Will definitely add it to my list! And I love the vest! I wish I could have seen inside one. But one of the food guys who will eat anything had the same place on his show the other day and he went inside. Pretty awesome! Thanks on the vest!